Bhavpreeta Thakur graduated in Political Science & Social Policy. After realising her interest for teaching, she went on to do a course called CELTA from British council. She also did masters in English Literature to qualify the eligibility of becoming a teacher. In 2015, she started her professional career with Quantum University as a English Language Trainer. After that, she joined DIT university as an Assitant Professor. She started her own company Engnite in 2017. She is also a Communication Trainer at Graphic Era University & Sai Institute. Professional Communication encompasses written, oral, visual and digital communication within a workplace context. It is a new discipline that focuses on the study of information and the ways it is created, managed, distributed, and consumed. 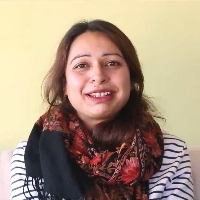 "After my graduation in Political Science & Social Policy, I realised my interest for teaching and I went on to do a course called CELTA from British council. I also did masters in English Literature to qualify the eligibility of becoming a teacher. In 2015, I started my professional career with Quantum University as a English Language Trainer. After that, I joined DIT university as an Assitant Professor. I started my own company Engnite in 2017. I am also a Communication Trainer at Graphic Era University & Sai Institute."